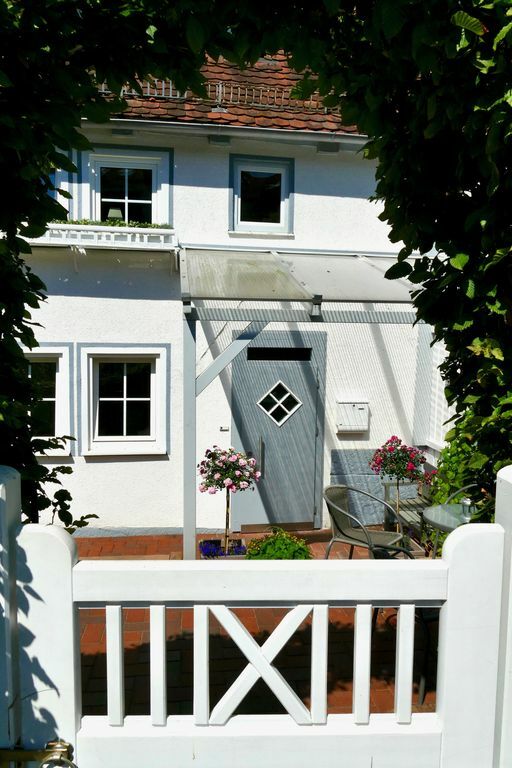 The country house is a very spacious, quiet, well-equipped, near-natural, family-friendly, charming and cozy quarter in Marburg-Wehrshausen with city proximity to the city Marburg and equally close to the forest. Quiet and idyllic location with beautiful views of the mid-mountain Marburger hinterland, located directly on the forest. The "Wehrshäuser Sonnenuntergänge" above and behind this backdrop offer special experiences. Plenty of wood in beams, paneling and floors spread comfort, charm and cosiness. The adjoining the residence of the landlord country house (built in 1862) was renovated in summer / autumn 2016 from scratch and completely refurbished. It has about 120 square meters of living space, a private entrance and private access to the street and a (partially covered) terrace with seating and stone and wooden bench overlooking the garden. The living space extends over two residential floors and an open gallery above the upper floor. Because of the stairs, the house is less suitable for persons with reduced mobility. Entrance hall; Living / working room with couch, seating, CD player, desk, high desk and wall unit; Bedroom with box-spring double bed (180 X 200 cm), large wardrobe and reclining chair with side table and floor lamp; large bathroom with toilet, washstand with drawers, hair dryer, mirror cabinet, shelf and combined bathtub / shower with glass wall; small utility room with washing machine, tumble dryer, vacuum cleaner, iron and ironing board, cleaning supplies. Adjacent to the dining area is a small bedroom with double bed (1.50 X 2.00 meters), side table and bookshelf. Both from there and from the entrance hall is a small bathroom with toilet, vanity (with drawers), hair dryer, combined tub / shower with glass wall. From the entrance hall, a staircase leads to the gallery, from which the view of dining area and kitchen is free. On the (open) gallery there is a TV corner with Smart TV (cable and Internet access) and DVD player, a comfortable sitting area, a single bed 90 X 200cm and an additional convertible to a Liegestatt stool (for a sixth person) and a desk with armchair. Free internet via W-LAN throughout the house. Free parking is located directly across the street. The Marburg-Wehrshausen district is 3.5 km from the center of Marburg (reachable by car in 7 minutes). There is bus connection to the city. (To the stop about 250 m). The bus to the old town of Marburg (and back) runs every hour. Spartaxis are inexpensive to book. Arrival by car / motorcycle recommended. About the directly adjacent forest and also along the route by footpaths to Marburg. Numerous hiking trails are directly accessible from the house via forest and field (z. B. Lahn hiking trail, Lahn-Dill-Bergland-path, Elisabeth path and various "local" routes). A popular climbing forest and good country inns are located in "walking distance". Happy to give the owner information and advice for potential enterprises. Written information material available. Wir haben vier wunderbare Tage in diesem gemütlichen und mit viel Liebe zum Detail ausgestatteten Haus verbracht. Schon der Emailkontakt vor Reisebeginn war sehr unkompliziert und freundlich, und so wurden wir bei unserer Anreise auch sehr freundlich vom Vermieter begrüßt. Das Haus ist groß und wunderschön eingerichtet und es fehlt wirklich an nichts - man fühlt sich regelrecht verwöhnt mit schöner Seife, Zeitschriften, Büchern etc. Sogar Spiele und Hörspiele sind vorhanden, ebenso wie jede Menge Infomaterial zur Umgebung. Man kann direkt vom Haus aus wandern und joggen gehen; Marburg erreicht man in wenigen Minuten mit dem Auto (oder sogar zu Fuß). Der Ort selbst ist sehr ruhig und friedlich. Mehrere Bäcker gibt es in den umliegenden Dörfern; weitere Einkaufsmöglichkeiten (inklusive Biosupermarkt) im nahen Marburg, des Weiteren ein schönes Schwimmbad und natürlich die malerische Stadt mit Schloss und Märchenpfad, sodass es auch mit Kindern genug zu erleben gibt. Wir haben uns insgesamt sehr wohl gefühlt, kommen gerne wieder und empfehlen das Haus und die netten Vermieter unbedingt weiter. Ganz herzlichen Dank noch einmal für einen herrlichen Aufenthalt! es freut uns sehr, dass wir mit unserem Angebot eine derart umfassend positive Reaktion hervorgerufen haben. Auch wir fanden die Zeit mit Ihnen sehr angenehm. Es wäre schön, wenn Sie Ihre Ankündigung im Hinblick auf eine Wiederholung "wahr machen" würden. Wir hoffen, dass der Wiedereinstieg in das Berufsleben nicht zu hart für Sie war. Sehr schön eingerichtetes Haus mit Liebe zum Detail. Tolle Ausstattung und ausreichend Platz für 4 Personen. Sehr nette Vermieter. Wir freuen uns über diese positive Rückäußerung! Auch wir waren mit Ihnen und Ihre Freundinnen als unseren Gästen sehr zufrieden. Sehr nett, äußerst ordentlich und sauber! Gerne würden wir Sie wieder bei uns begrüßen. Saubere und gepflegte Unterkunft, gerne wieder! Unser Mitarbeiter war mit der Unterkunft mehr als zufrieden. Die bereits abgegebenen positiven Bewertungen kann ich nur bestätigen. Ein sehr liebevoll eingerichtetes Haus in angenehmer Umgebung und netten Vermietern. Für Marburg und Umgebung eine echte EMPFEHLUNG !! Lieber Herr Joachim, besten Dank für die freundliche Beurteilung! Es tut gut zu erfahren, dass es Ihnen und Ihrer Frau bei uns so gut gefallen hat. Wir waren auch mit Ihnen als unseren Gästen sehr zufrieden und wuerden uns ein Wiedersehen wünschen. Beste Grüße von Marburg nach Bayern! A very sweet and nice house. Fully equiped, kind landlord, place to return to. We really felt at home in this very comfortable house. wir freuen uns sehr darüber, dass es Ihnen bei uns so gut gefallen hat. Gerne sehen wir Sie wieder! The house is suitable for holiday stays as well as for long-term stays (eg. Eg for business stays or guest lecturers, etc. ), as well as for parents who visit their children in Marburg. Ideal location for placement of employees, customers and business partners of the pharmaceutical companies in the districts of Marbach and Görzbach. The district Marburg-Wehrshausen located 3km to Marburg's center (by car in 5 minutes.). There is bus connection to the city. Numerous hiking trails are directly accessible from the house via forest and field (z. B. the long distance trail Lahn trail and the Lahn-Dill-Bergland-path and several local hiking trails). A popular climbing forest and good country inns are in "walking" nearby.